There is another study that offers strong support for the dangers of both smoking and second-hand smoke. The study at the University of California – San Francisco found a dramatic decline in hospitalizations in areas with laws banning smoking at work and public areas. The study found fewer hospitalizations for heart attacks, strokes, asthma and other respiratory conditions.The research covered 33 different smoke-free-laws in cities and states as well as several countries like New Zealand and Germany. The study found a 24 percent drop in hospitalizations for respiratory diseases, including asthma and chronic obstruction. There was also a 16 percent drop in stroke hospitalizations and a 15 percent drop in heart attack admissions. This would suggest a high savings in cost and illness with these laws. There is no reason why other citizens should have to bear these externalized costs. The study could also reinforce tort claims in terms of the harm caused by second-hand smoke. There are a lot of things that people do in public, that irritate select other people in public. Smoking is one of them. Religious missionaries is also one. Offensive messages on T-Shirts are another. Breast feeding in public is another. The point here is, although the things we see others do in public may be irritating to us, it cannot be a basis to outlaw it for all. The objective element here is not whether it irritates someone for one reason or another, but rather whether it actually presents an involuntary health hazard. In the case of second hand smoke, it does not. Health issues or not, second hand smoke irritates me beyond reason because I have a very sensitive nose. So many of my neighbors smoke that many a lovely day I have to keep the doors and windows closed so I do not have to smell those noxious fumes. I cannot keep the window down in the car at stop lights if someone near is smoking. It’s just something I have to live with. I don’t care to much if folks want to kill themselves with smoking. I just don’t want to have to be a part of it. For your added reading pleasure, here is the PDF of an article from the journal Public Health. Down toward the bottom there is a scathing editorial from The Lancet. There is a lot of material here, and it is rather dense going, but there are some real nuggets of information in all this. OK, you guys argue about the CDC and politics; however, the health related impact of second hand smoke has been studied for many years in countries all over the world. Politics has nothing to do with the findings. I do note the tobacco industry has thrown an enormous amount of money into trying to debunk the science. Hmmm….Now where have we heard of that tactic before? The consensus in the scientific community is unanimous. Second hand smoke is toxic. However, precise studies of just how toxic is complex due to the fact many toxic effects may be delayed for decades. However, here is a link to just a very small sample of the thousands of studies out there. Knowing what we know about second hand smoke, any employer who allows smoking on the premises of his or her business is just asking for it in terms of liability issues. Since most of our readers are associated with the legal profession, I do not need to go into detail about that aspect. Here is the result of a simple search on Google Scholar. The results in this search parameter just scratches the surface of what is out there, yet, this simple search yielded almost a million studies. Colonialism has morphed into capitalism, Countries do not have to occupy foreign lands any longer to exploit the populace. We just let our corporations do that now. Certainly not Elaine…. People have the right to expect big business to kill somehow…. Whether it be gas, oil, drugs, food….. Pick your poison…. We have all kinds of pollutants in the air we breathe. Are you suggesting that we shouldn’t try to do something about one type of pollutant because it may not be as bad as other pollutants? Is that your logic? If secondhand smoke is all that bad… Lol…. Then why do we have worse pollutants in my opinion…. You can build all the straw men you like, but the bottom line is I said nothing of the sort. I said – and read this carefully – that is if the Houston Chronicle article said what you claimed it did, namely that “THAT THERE IS NO SAFE LEVEL OF SECOND HAND SMOKE”? That that was bad science and bunk. Nothing more. Oh, except that your claims the study is flawed need more proof than you just didn’t like the results. That’s every bit of the polemics over science you accuse others of. Science has very simple rules. You formulate a theory, you build tests and collect data, and you make correlations to test the validity of the theory. Absent proof of methodological misconduct or factual error in observations, results stand until disproved. That the second hand smoking studies are not ipso facto valid does not make them ipso facto invalid absent proof of error. If you keep trying to put words in my mouth then your going to simply get made to look the fool. If you don’t like that I’m pointing out that you’re engaging the very same sort of bad science you accuse others of practicing? I suggest you learn how science work better and realize that you are bias is showing. You are essentially dismissing a study based on no evidence of false evidence or methodological impropriety and that is in itself bad science. Again, if you have proof of bad evidence or methodological impropriety in regard to this particular study? Present it. Your unfounded opinion does not constitute proof. Your detection skills have failed you. Those substances also have UNSAFE levels of exposure! I posted excerpts from and links to some reports/statements/articles on the subject of the negative effects of secondhand smoke that, I thought, were pertinent to the discussion on the subject of this thread. Why are you getting your knickers in such a twist? I didn’t say that it did. I did, however, say that your claims the study is flawed need more proof than you just didn’t like the results. That’s every bit of the polemics over science you accuse others of. Science has very simple rules. You formulate a theory, you build tests and collect data, and you make correlations to test the validity of the theory. Absent proof of methodological misconduct or factual error in observations, results stand until disproved. That the second hand smoking studies are not ipso facto valid does not make them ipso facto invalid absent proof of error. Gene H while I am sorry that you wound up on the side of the argument you do not like, I DO have to remind you and others that you agreed that the statement that there is NO level of second hand smoke that is risk free, was BUNK. I did not say that there is no correlation between second hand smoke and deleterious health results. Though I have to place such studies in the same category as the ones that had equal force in showing conclusively that blacks as a group are less intelligent than whites. Such studies run into the problem that correlation does NOT mean causation. Any “study” that makes such absurd conclusions are flawed in the exteme. So I think that most rational people join me in rejecting such racial studies, but when it comes to similar ones dealing with their pet peeves, then they lose all objectivity and scientific standards and swallow whole and hard. The key to evaluating such studies is to see if they show a level of second hand smoke that is safe or to set standards as we do for ALL other toxic substances, except in THIS ONE CASE! For this study, it is simply sufficient to make an absurd conclusion that is NOT supported by FACT, experiments, or data of any kind. If it were, we could set standards, but the whole point of the study is to do the opposite, and create hysteria rather than rational findings. Maybe you could tell us how those studies come to such a farcical conclusion if it is a valid study. From what I have seen it is on the same level as the ones on pot that were used to make its use illegal. Any “study” that cannot say what level of second hand smoke is toxic, nor set a time line for its presence of a week or years, the composition or the elements and which ones and which rate of decay, ALL of which are part and parcel of science. On its face the study is JUNK science and propoganda. It gets even worse, when actual scientific studies that used experimental data show the opposite conclusions as Gary T has pointed out. So all in all, I think that you should stick with your origianl statement that the conclusion is absurd that there is NO risk free level of second hand smoke. Of course, that means you will have to buck the mobs wants and desires and the CDC. Elaine, ALL of those substances you mentioned have SAFE levels of exposure. Thus to say that second hand smoke is a high risk or has no level of second hand smoke is safe is absurd. I detect a grudging acceptance of what i contend. I guess it depends on how you interpret what the CDC statement means. I believe it’s important to find out who conducts research studies and who funds the research. 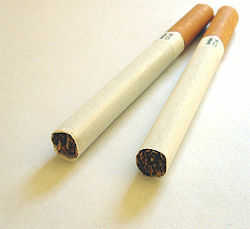 The tobacco industry funded a number of studies over the years. BTW, I do use my “rational capacity” when thinking about issues such as the effects of secondhand smoke on non-smokers. Secondhand smoke contains some things that are known to be harmful. It seems logical to deduce that if one inhales those chemicals/components of the smoke, it could be harmful to one’s health. Among the more than 7,000 chemicals that have been identified in secondhand tobacco smoke, at least 250 are known to be harmful, for example, hydrogen cyanide, carbon monoxide, and ammonia. Many factors affect which chemicals are found in secondhand smoke, such as the type of tobacco, the chemicals added to the tobacco, the way the tobacco product is smoked, and, for cigarettes and cigars, the material in which the tobacco is wrapped (1, 3, 4). You have no idea what I was trying to say. I think that telling people what they are trying to say is presumptuous. Saying that I think it’s okay to lie goes beyond the pale…and is obnoxious. Get a grip! What were those studies? Who conducted them? Who financed them? You obviously know nothing about medicine testing nor testing and scietific reporting in general either. Let me explain. Under the existing conditions of the study and the measurement conditions, where the former are the most significant. NO lower level there non-toxic levels could be established was found. IE, at the lowest level that could be established and confirmed the effects of toxicity were still present in the data, after correcting for different factors. Just for kicks, let me enlighten you further. This situation is one that leads to the “loneliness of the long-term researcher”. He gets so far from “normal” peoples works that he feels that no one understands what he is doing or thinking about to do it. How far you are away, is typical, not atypical at all, so console yourself for that. and scietific reporting in general either. I don’t know if this is an intentional self parody or not, but thanks anyway for providing a good laugh and brightening my day. Now to what I think you were trying to say that it is OK to lie to the great unwashed benighted public. That smacks of an elitism that I find rather obnoxious and condescending. While i like to think that the left in general has fewer foibles and prejudices, with the exception of Stalinists, I see that some on the left are just as bad as the right. In your case, you show a perfect example of a closed mind. Gary T has given multiple examples and sources that destroy the CDC studies. Just from examination of the statement that there are NO safe levels of second hand smoke it should be a red flag warning of the bias and absurd nature of the study, and that your contention that it is OK to lie validates that evaluation. So we are left with the FACT that the CDC is making a POLITICAL statement, NOT a scientific one. Their political agenda is to eliminate smoking in the public completely, and so they use any means at hand. Just as the studies proving blacks were intellectually inferior to whites was more a political statement than a fact, the same is true of the CDC findings. What is “the political nature” of the reports/studies of which you speak? Can you explain why the studies are not legitimate? Do you believe that secondhand smoke is harmless? What studies are those? Who conducted those studies? Elaine, I recall similar scientific studies that showed that blacks were genetically less intelligent than whites and they used similar techniques to PROVE their contentions. The same was true of the reports on smoking pot where they simply lied about the dangers of it and I assume provided studies to show that as well. So using an authority is NOT always a valid means of getting the truth. One has to use ones own rational capacity in evaluating such things. Now that some states have passed laws permitting the smoking of pot for recreational use, I will have to assume that the no smoking rule in doors will be waived, but only for pot and not tobacco. Pot is obviously NOT delleterious to ones health at all, so any rules on no smoking will not be enforced and that second hand smoke from it is OK. This despite the FACT that pilots like myself who have to take random drug tests may well be affected in a rather severe way with the loss of our jobs. It is amusing that many of those who are quite vociferous against second hand tobacco smoke have no problem with pot. The question that is posed is NOT is second hand smoke harmless, but whether ANY level of second hand smoke is bad. According to the CDC statement, a person smoking in a building that is 50 stories high is a danger to ALL the occupants even if that smoker is 50 stories away from a person. I think that even YOU would have to agree that is a rather far fetched idea. Another example is a person has smoked in a motel room two years previously, and that constitutes a danger to a non-smoker today using the same room. The problem is that such studies give NO clue as to the level of toxicity of second hand smoke, nor do they quantify such levels and places. Nor do they quantify or take into account other causative factors. Even 707 admits that there is no feasible means of doing such experiments. Though some studies such a Gary T has cited show no major health risk in second hand smoke. I think it is fairly obvious that if you are in a small room with 20 smokers and no circulation or venting of air, such levels are NOT good for those who do not smoke. But the matter in question is the validity of such a sweeping and absurd statement given by the CDC. It is purely political as 707 admits.